Exhibit A is the flame-haired belle in the flowered dress, pastel boa and extravagantly painted lips who has flung herself across a patch of green cow pasture as if it were the seamless paper in Richard Avedon's studio. A half dozen oblivious cows grace the horizon. 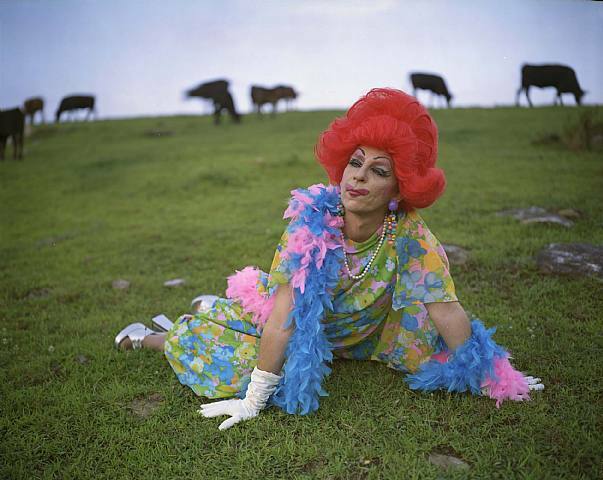 Rueben Cox photographed drag and transgendered subjects in New York, New Orleans, Memphis, and Nashville in 2004. I have to try to get there before it closes on Saturday. It's on 17th Street in the space once occupied by Rupert Goldsworthy Marcus Ritter. After seeing Reuben Cox's second show at the Bespoke Gallery (it turns out they moved to a new space.. the same building as aperture), I found his website. here it is if anyone is as interested. Published on January 27, 2005 10:51 PM.